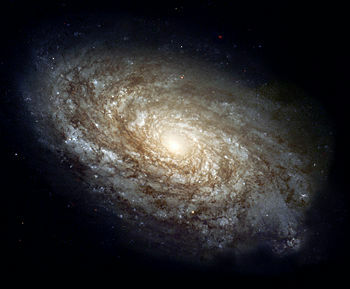 NGC 4414, a typical spiral galaxy in the constellation Coma Berenices, is about 56,000 light-years in diameter and approximately 60 million light-years distant from Earth. Astrophysics is the branch of astronomy that deals with the physics of the universe. It involves studies of the physical properties (luminosity, density, temperature) and chemical composition of celestial objects as well as their interactions. Scientists in the field of astrophysics are known as astrophysicists. They typically apply many areas of physics, including mechanics, electromagnetism, statistical mechanics, thermodynamics, quantum mechanics, relativity, nuclear and particle physics, and atomic and molecular physics. Astrophysics can be subdivided into observational and theoretical aspects. Through observational astrophysics, scientists have discovered and studied such objects as planets, stars, pulsars, magnetars, galaxies, nebulae, and black holes. They have also observed the birth and death of stars, cosmic rays, the cosmic microwave background radiation, and the composition of the interstellar medium. Theoretical astrophysics has led to models for the formation and evolution of stars, galaxies, and the universe as a whole. It has led to theories about the Big Bang and cosmic inflation, proposals about the existence of dark matter and dark energy, and the formulation of string cosmology and astroparticle physics. Albert Einstein's general theory of relativity plays a major role in theoretical astrophysics. Although astronomy is as ancient as recorded history itself, it was long separated from the study of physics. In the Aristotelian worldview, the celestial world tended towards perfection: Bodies in the sky seemed to be perfect spheres moving in perfectly circular orbits. By contrast, the earthly world seemed linked to imperfection. These two realms were not seen as related. Aristarchus of Samos (about 310–250 B.C.E.) first put forward the notion that the motions of the celestial bodies could be explained by assuming that the Earth and all other planets in the Solar System orbited the Sun. Unfortunately, in the geocentric thinking of the time, Aristarchus' heliocentric theory was deemed outlandish and heretical, and for centuries, the apparently common-sense view that the Sun and other planets circled the Earth went basically unquestioned. Later, in the sixteenth century, the astronomer Nicolaus Copernicus revived the heliocentric model, giving it a mathematical foundation. In 1609, Galileo Galilei discovered the four brightest moons of Jupiter and documented their orbits about that planet. His work gave observational support to the heliocentric model. However, he was compelled to recant his heliocentric ideas to escape serious punishment from the Catholic Church, which held the geocentric dogma that was prevalent at that time. The availability of accurate observational data (mainly from the observatory of Tycho Brahe) led to research into theoretical explanations for the observed behavior. At first, only empirical rules were discovered, such as Kepler's laws of planetary motion, discovered at the start of the seventeenth century. In the later part of that century, Isaac Newton bridged the gap between Kepler's laws and Galileo's dynamics, discovering that the same laws that rule the dynamics of objects on Earth rule the motion of planets and the Moon. Celestial mechanics, the application of Newtonian gravity and Newton's laws to explain Kepler's laws of planetary motion, became the first unification of astronomy and physics. After Isaac Newton published his book, Philosophiae Naturalis Principia Mathematica, maritime navigation was transformed. Starting around 1670, the entire world was measured using essentially modern latitude instruments and the best available clocks. The needs of navigation provided a drive for progressively more accurate astronomical observations and instruments, providing a background for ever more available data for scientists. At the end of the nineteenth century, when analyzing sunlight, a multitude of spectral lines were discovered (regions where there was less or no light). Experiments with hot gases showed that the same lines could be observed in the spectra of gases, specific lines corresponding to unique chemical elements. In this way, it was shown that chemical elements found in the Sun (chiefly hydrogen) were also found on Earth. Indeed, the element helium was first discovered in the spectrum of the Sun and only later on Earth, hence its name. During the twentieth century, spectroscopy (the study of these spectral lines) advanced, particularly as quantum physics was developed and found necessary to understand the astronomical and experimental observations. Astrophysical observations are generally made in various segments of the electromagnetic spectrum, as indicated below. Optical astronomy is the oldest kind of astronomy, involving the observation of celestial objects in the visible range of light. The instrument most commonly used is the telescope, paired with a charge-coupled device or spectroscope. The Earth's atmosphere interferes somewhat with optical observations, so image quality is improved by the use of adaptive optics and space telescopes. By studying the spectra of objects in the night sky, researchers are able to determine the chemical composition of stars, galaxies, and nebulae. In radio astronomy, scientists study radiation with a wavelength greater than a few millimeters. The instruments used are very large radio telescopes. Radio waves are usually emitted by cold objects, including interstellar gas and dust clouds. The cosmic microwave background radiation is thought to be the redshifted light from the Big Bang. Pulsars were first detected at microwave frequencies. Infrared astronomy involves the study of radiation of wavelengths longer than the wavelengths of visible light but shorter than those of radio waves. Infrared observations are usually made with telescopes similar to the usual optical telescopes. Objects colder than stars (such as planets) are normally studied at infrared frequencies. Ultraviolet, X-ray, and gamma ray astronomy involve the study of very energetic processes, such as binary pulsars, black holes, magnetars, and many others. These types of radiation are blocked by the Earth's atmosphere to a large extent. To observe celestial objects and phenomena in these regions of the electromagnetic spectrum, scientists rely on space-based telescopes and ground-based imaging air Cherenkov telescopes (IACT). Observatories of the first type include RXTE, the Chandra X-ray Observatory, and the Compton Gamma Ray Observatory. Examples of IACTs are the High Energy Stereoscopic System (H.E.S.S.) and the MAGIC telescope. Besides studying electromagnetic radiation from distant objects, astrophysicists also look for such things as gravitational waves, neutrinos, and cosmic rays. A few gravitational wave observatories have been constructed, but gravitational waves are extremely difficult to detect. Neutrino observatories have also been built, primarily to study the Sun. Cosmic rays, consisting of very high energy particles, can be observed striking the Earth's atmosphere. Observations can also vary by timescale. Most optical observations take minutes to hours, so phenomena that occur faster than that cannot be readily observed. Also, historical data on some objects is available spanning centuries or millennia. On the other hand, radio observations may look at events on a millisecond timescale (millisecond pulsars) or combine years of data (pulsar deceleration studies). The information obtained from these different timescales is very different. Study of the Sun occupies a special place in observational astrophysics. Given the tremendous distances of all other stars, the Sun can be observed at a level of detail unparalleled by any other star. Human understanding of the Sun serves as a guide to the understanding of other stars. The topic of how stars change, or stellar evolution, is often modeled by placing the varieties of star types in their respective positions on what is called the Hertzsprung-Russell diagram. This diagram can be viewed as representing the state of a stellar object from birth to destruction. Theoretical astrophysicists endeavor to create theoretical models and figure out the observational consequences of those models. This approach helps observers look for data that can confirm or refute a model, or helps them choose between several alternate models. Theorists also try to generate or modify models to take into account new data. In the case of an inconsistency, the general tendency is to make minimal modifications to a model to fit the data. In some cases, a large amount of inconsistent data over time may lead to total abandonment of a model. 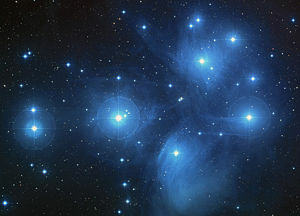 Theoretical astrophysicists use a variety of tools, including analytical models (such as polytropes to approximate the behavior of a star) and computational numerical simulations. Each offers some advantages. Analytical models of a process are generally better at giving insights into the heart of what is going on. Numerical models can reveal the existence of phenomena and effects that cannot otherwise be seen. Topics studied by theoretical astrophysicists include: Stellar dynamics and evolution; galaxy formation; large-scale structure of matter in the Universe; origin of cosmic rays; general relativity and physical cosmology, including string cosmology and astroparticle physics. Astrophysical relativity serves as a tool to gauge the properties of large-scale structures in which gravitation plays a significant role in physical phenomena, and as a basis for understanding black holes and gravitational waves. Some widely accepted and studied theories and models in astrophysics, now included in the Lambda-CDM model are the Big Bang, cosmic inflation, dark matter, and fundamental theories of physics. Dark matter and dark energy are the current leading topics in astrophysics, as their discovery and controversy originated during the study of galaxies. ↑ H. Falcke and P.L. Biermann, Frontiers of Astrophysics: Workshop Summary. Retrieved February 26, 2017. ↑ H. Roth, A Slowly Contracting or Expanding Fluid Sphere and its Stability, Physics Review 39(1953): 525–529. Carroll, Bradley W., and Dale A. Ostlie. An Introduction to Modern Astrophysics, 2nd edition. San Francisco, CA: Pearson Addison-Wesley, 2007. ISBN 978-0805304022. Inglis, Mike. Astrophysics Is Easy! : A Complete Introduction for Amateur Astronomers. New York: Springer, 2007. ISBN 978-1852338909. Maoz, Dan. Astrophysics in a Nutshell. Princeton, NJ: Princeton University Press, 2007. ISBN 978-0691125848. Seaborn, James B. Understanding the Universe: An Introduction to Physics and Astrophysics. New York: Springer, 1998. ISBN 0387982957. Cosmic Journey: A History of Scientific Cosmology from the American Institute of Physics. Astrophysical Chemistry Video Lectures by Harry Kroto, 8 Freeview Lectures provided by the Vega Science Trust. Institute for Space Astrophysics and Cosmic Physics, IASF-Bologna, one of the institutes of INAF – the Italian National Institute for Astrophysics. Astronomy and Astrophysics, a European Journal. This page was last modified on 26 February 2017, at 19:58.